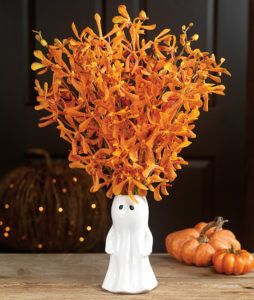 Halloween is knocking on our doors and these Ghost Orchids are quite the treat with bright orchids festively dancing above the most boo-tiful ghost vase! The spookiest season is officially upon us — it is nearly Halloween! In celebration of all things ‘spirited’, we have put together a list of our favorite flowers that celebrate a ghoulish good time. While many consider Halloween a children’s holiday with costumed kids gathering piles of candy from trick-or-treating, Halloween also celebrates the natural world around us. From carving jack-o-lanterns out of pumpkins to apple picking and gathering natural objects into cornucopias or fall tablescapes, Halloween is a celebration of the gathering season. We have collected several of our favorite fall flowers that perfectly align with a Halloween theme, be it a fun nickname or a festive shape and color. Take a look at a few of our favorites and how we’ve used them to create floral arrangements to maximize the décor options for your Halloween festivities! Our Bold Zinnia Wreath is a lovely way to hang out with the the most aptly named Halloween flower of all: Brain Celosia! Brain Celosia is an annual plant that is brightly colored member of the Amaranth family. Its Latin name, Celosia cristata translates as “crested,” which refers to the crested ripples and curls that gives Brain Celosia its organ-inspired name. Brain Celosia comes in a variety of brilliant and vibrant colors ranging from bright yellows to dark purples. The most popular shades, though, are red and pink with a deep, rusty red being the most striking. While the height of its growing season is in the summer, Brain Celosia makes a wonderful fall flower as it remains beautifully bright even when dried. 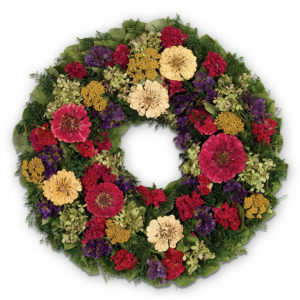 We’ve used the popular red variety in our Bold Zinnia Wreath. Brain Celosia is paired with other naturally preserved components such as dried Yarrow and Hydrangea to create a preserved design with seasonal elegance. Hang one on your door for a lustrous and dynamic entryway display. Orange Mokaras have fiery red flecks reminiscent of fall colors like orange pumpkins and autumn leaves. Orange honors the warm and joyous colors of fall. 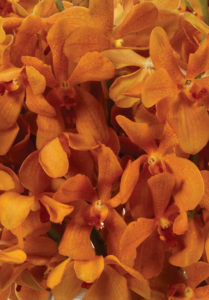 From the ‘Great Pumpkin’ to vibrant leaves,our magnificent orange Mokara orchids wonderfully represent this season. 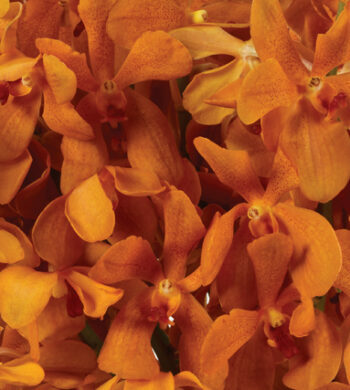 With gorgeous orange petals flecked with red and billowy star shaped blossoms, the Mokara orchid is eye-catching with its festive color. These orchids bear resemblance to the changing fall leaves but add a tropical touch of the exotic. We have two wonderful options for those wanting to decorate for Halloween with orange Mokaras. Our Ghost Orchids are a fun arrangement with orange Mokara orchids filling a spooky yet sweet ghost vase. For those looking for an abundance of blooms to decorate with, we also have larger quantities of orange Mokaras available. This option is perfect for creating a fall wedding bouquet, adding depth to an existing bouquet at home, or using creatively by filling a white pumpkin or another fall-centric gourd. Our Pumpkin Sunflowers pair bright sunflowers with Solidago, or Goldenrod, to capture the essence of fall colors for fun Halloween decor. Solidago, more commonly known as goldenrod, is a yellow flower that plays on the golden mustard yellow hues of fall. The goldenrod flower has a showy bloom and can be used medicinally to treat kidney ailments, sore throats, and toothaches, so this flower is not only beautiful but also useful! With all of these potential uses, Solidago has sometimes been considered to be a sign of good luck or fortune. You’ll see Solidago mixed in with our Pumpkin Sunflowers arrangement as its warm golden florets accentuate the sunflowers’ glow and add wonderful texture to the bouquet. 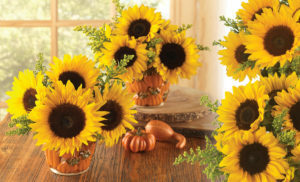 Placed in a captivating ceramic pumpkin patch vase, these Pumpkin Sunflowers will be a welcome sight on a front porch for trick-or-treaters or as a fun friend to freshly carved jack-o-lanterns. Fall may be fleeting but with all of these options, we are excited to get into the spirit of Halloween to celebrate vivid and vibrant colors and gathering friends, flowers, and treats!